We have inherited a large and comprehensive archival collection from Traugott Fuchs. This collection includes thousands of documents stored in one hundred fifty boxes, two hundred oil paintings, more than six thousand sketches, two thousand books and hundreds of photographs. In the boxes, one can find Fuchs’s works (translations, poems, etc. ), teaching notes, correspondence with students and colleagues as well as with important German intellectuals like Leo Spitzer, Erich Auerbach, Hermann Hesse, and Hellmut Ritter, materials pertaining to his social activities, biographical documents (diaries, letters, and travel notes) and his family archive. Traugott Fuchs was born on 23 November 1906 in Lohr, a small village in the Alsace region, the fourth of six children had by Marie Adelheid (born Krencker) and the Protestant pastor Karl Fuchs. He attended schools wherever his father was sent as a pastor, that is, first in Karlsruhe (Baden) and then in Metz (Lorraine). Following World War I, when Alsace-Lorraine became French territory, Fuchs’s Prussian-minded father decided to move the family to the village of Schmalkalden, located in the southwestern part of the state of Thuringia, Germany. Upon graduating from high school, Traugott Fuchs studied the philologies of the French and German languages as well as art history in Berlin, Heidelberg, Marburg and Cologne. He was a student of philosopher and psychologist Eduard Spranger, philologist Gustav Roethe, art historian Max Friedländer, literary scholar and poet Friedrich Gundolf, and philosopher Karl Jaspers. His acquaintanceship in Marburg with the prolific literary critic Leo Spitzer, an Austrian Romanist and Hispanist, would decisively change the course of Fuchs’s life. Traugott Fuchs followed Leo Spitzer in 1930 to the University of Cologne, where he became one of his assistants. However, being a Jew, Leo Spitzer had to leave Germany in 1933. Fuchs, not a Jew himself, initiated political action at the university in support of his professor. Consequently, he was persecuted by the university authorities for organizing a demonstration on the birthday of Adolf Hitler in support of Leo Spitzer. Following these events, Fuchs left Germany during the academic year of 1933-34 for a position as a lecturer at the University of Caen in Normandy. Traugott Fuchs arrived in İstanbul in February of 1934 at the age of twenty-eight. As he wrote later, he arrived “with two simple suitcases in hand” (Fuchs, 1986). Fuchs was part of a larger wave of German intellectuals, around 200 to 250 people, who left or were exiled from Nazi Germany and came to Turkey. Traugott Fuchs first taught French at the Foreign Language School of İstanbul University. Soon after, he started teaching German Philology at the Faculty of Letters of the same university and he continued teaching this curriculum from 1934 to 1978. Alongside his İstanbul University courses, Traugott Fuchs also taught German and French at Robert College/Boğaziçi University between 1943 and 1983. He spent a year in Sorbonne as a lecturer in the early 1950s. Upon applying for retirement in 1977, it was discovered that so far he had not been admitted to any pension scheme at either university. Through the mediation of Erdal İnönü, the ex-Dean of the Faculty of Arts and Sciences at Boğaziçi University, he was re-appointed as a full-time Assistant Professor and thus qualified for official retirement. He lived in room 13 of Hamlin Hall (today’s Boys Dormitory at the South Campus of Boğaziçi University) from the mid-1940s to 1971, when he moved to a private flat in the district of Rumelihisari. Between the years 1934 and 1944, Traugott Fuchs worked on his dissertation titled “The Je ne sais quoi in the Romance Languages,” under the supervision of Leo Spitzer. His supervisor approved the dissertation, but before Fuchs could officially defend it, the manuscript was burned to ashes during a fire which broke out in Fuchs’s apartment in the Beşiktaş district (Ayazpaşa). Between 1944 and 1945, Traugott Fuchs was interned for thirteen months in Çorum. When Turkey terminated its diplomatic relationships with Germany in August of 1944, the German citizens residing in Turkey were presented with the choice of either going back to Germany or, in order to avoid recruitment to the German army, being interned in small Anatolian cities such as Kırşehir, Yozgat, and Çorum. In 1983, at the age of 77, Traugott Fuchs retired from his professorship. He continued to accept and teach students at his house in Rumelihisari. He stayed at the Austrian St. George Hospital in Beyoğlu during the last years of his life. Traugott Fuchs died there on 21 June 1997. 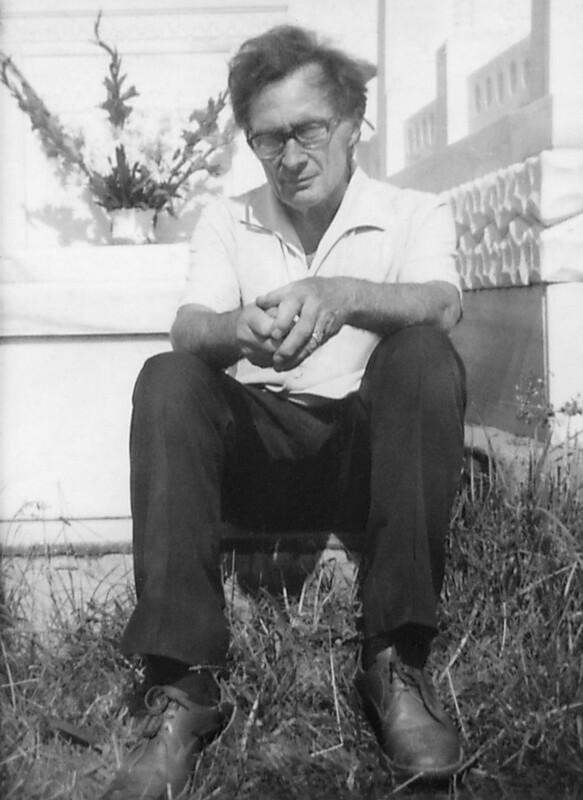 During Traugott Fuchs’s funeral on 27 June 1997, the German pastor of the Protestant Church in İstanbul finished his speech with an excerpt from a poem by Nazım Hikmet. Traugott Fuchs was a multi-faceted person. Coming from a typical background of the Prussian “Bildungsbürgertum” (educated middle-class), he cherished humanistic education, science and literature. Characteristically, he has been called the “last Renaissance man.” Fuchs literally dedicated his life to teaching, painting, writing and playing music. Traugott Fuchs taught for forty-nine years, nearly half a century, at İstanbul University and at Robert College/Boğaziçi University. What was Traugott Fuchs Teaching? His teaching notes, comprising a wide range of issues, and his vast library, show that Fuchs was constantly expanding his horizons. Fuchs’s archive comprises an extensive library containing two thousand books. The books cover all kinds of writers and poets from the German and Romance languages and literatures, with particular attention given to modern European literature. Many of the books must have had a deeper value for Fuchs, since they were written by famous colleagues or students of his and include the authors’ handwritten dedications to Fuchs. Traugott Fuchs primarily taught German and French languages and literatures. Nevertheless, glancing at his teaching notes, one travels through different epochs (from antiquity, to the Middle Ages, up to modern times), encountering an endless list of classics, of known or lesser-known writers and different subjects within literature, linguistics, religion and philosophy. In Fuchs’s archive, one can find notes, maps and tables on various grammatical issues, given self-designated titles, and pertaining, for example, to vowel mutation in Old High German, consonant changes of the German language throughout the centuries, the grammar of Middle High German and the etymologies of various German words or loan words from various languages to the German language. The writers, poets and philosophers on whom Traugott Fuchs kept notes, in order to teach them to his students, constitute an endless list of names. Among these names one can find what would be called the “classics,” but also lesser-known names, showing that Traugott Fuchs sought to encompass a plurality of voices, including alternative and even marginal ones. He latter included female voices in his lectures, active in different times and places. Moreover, while his focus was on German literature, we encounter also French, Austrian, Turkish, Russian, Indian, Icelandic and Hungarian figures among the writers taught in Fuchs’s classes. The journey through the lessons of Traugott Fuchs starts from antiquity, with poets such as Homer and Sappho from Mytilene; philosophers such as Plato, Sophokles and Euripides; and storytellers like Aesop. Moving on to the Middle Ages, Traugott Fuchs would cover writers and poets such as Dante, Mechthild von Magdeburg, the female mystic, and Ulrich von Lichtenstein. Pertaining to the eighteenth century, Traugott Fuchs would introduce his students to the classic figures like Immanuel Kant, Friedrich Schiller and Jakob Michael Reinhold Lenz. Amongst the literary figures active from the eighteenth to the twentieth centuries, Traugott Fuchs dealt with hundreds of names in his lessons. These include (in chronological order) Johann Wolfgang von Goethe, Heinrich Heine, Friedrich Hölderlin, Novalis, Joseph Freiherr von Eichendorff, Friedrich Nietzsche, Georg Büchner, Rainer Maria Rilke, Bertold Brecht, Martin Heidegger, Georg Lukács, Klabund (the nickname of Alfred Georg Hermann Henschke), Georg Trakl, Arno Holz, Gottfried Benn, Hermann Hesse, Friedrich Dürrenmatt, Hermann Lenz, Wolfgang Borchert, Heinrich Böll, Sait Faik Abasıyanık, Franz Kafka, Günter Eich and Simone Weil. His teaching also encompassed music and the analysis of popular songs such as “Lilli Marlen” written by Lale Andersen and “Love” written by John Lennon. Traugott Fuchs’s lectures did not end with linguistics and literature but expanded to philosophy (“Surrealism”), religious issues (on Luther, the Hebrew Bible, the Seven Seals from the book of Revelation, “Genesis and the Fall,” the early Christian martyrs Sergius and Bacchus and pietism), and to historical subjects (the history of the German city of Jena, of the Staufer dynasty which ruled between the eleventh and the thirteenth centuries, of Germanic tribes like the Cimbri, the Teutons and the east Germans). According to one such report written by Traugott Fuchs, during the second semester of the academic year of 1955-56, Fuchs taught the courses “Language History for Beginners,” “Language History for Advanced Students,” “Course on the Novels of Hugo von Hofmannsthal (1874-1929),” “Course on the Novel Hadlaub of Gottfried Keller (1819-1890)” and “Course on Gottfried Benn (1886-1956)” at İstanbul University. All of these courses, which Fuchs taught to twenty-three students, amounted to eleven hours per week. The same report contained a smaller part dedicated to his teaching activities at Robert College. Traugott Fuchs stated that he was the only professor responsible for German at this university. Thus, he had to teach four classes adding up to fourteen hours per week during the academic year of 1955-56, as well as that of 1956-57. The courses he taught were comprised of elementary grammar, history of literature, poetry and idiomatics. With his younger students, Fuchs focused on the Romantic period, and with his older ones, he discussed Rainer Maria Rilke and short compositions on subjects the students had selected themselves. These included both old and modern German music such as Johann Sebastian Bach and Paul Hindemith. "A. An overview of the novel’s structure, its composition and main parts; B. The students’ comments on Hesse’s personality, focusing on Hesse ‘‘as artist and genie,’’ and his relationship to the concepts of daytime, death, the bourgeoisie, to the question ‘‘What is the human being?’’ and to the cosmos; C. Explain the story of Steppenwolf, his illness and crisis, the different therapeutic stages of his cure, their meanings." The various MA theses which were supervised by Traugott Fuchs and are still present in the archival collection of Fuchs provide us with hints to the subjects Fuchs taught and discussed with his students. In them, we encounter subjects such as a novels by Theodor Storm, Johann Wolfgang Goethe, Bertold Brecht, Conrad F. Meyer, or J.M.R. Lenz, or poems by Günter Eich or Friedrich Schiller. The body is but a shell. The artistic works of Traugott Fuchs depict villages and townships, locals, different professions, herbs, flowers, buildings, houses, historical buildings, and antique ruins, having thus both a cultural and an artistic value. His motifs were humans and landscapes of İstanbul and the Turkish countryside. Traugott Fuchs was a writer, poet and translator; nevertheless, he rarely published anything, so his works are hardly known today. In his collection, one can find his own literary works (including a book called La Première Poésie de Rimbaud, translations from Sait Faik Abasıyanık, Gustave Flaubert and Süleyman Çelebi), his “Günaydın Collection” and around 450 poems. A remarkable part of Traugott Fuchs’s writings is contained within the “Günaydın Collection.” This is a collection of more than seventy notebooks, into which Fuchs would paste clippings from the Turkish newspaper Günaydın starting from 1971. The clippings relate to all aspects of political, social and cultural life in Turkey. Furthermore, Fuchs would comment with his own writings and sketches on the clippings, often in a satirical way. The “Günaydın Collection,” which continued up to 1990, provides its readers with invaluable insights on Turkish social life, accompanied by the sharp comments of Fuchs himself. A little-known passion of Traugott Fuchs's was music. He was a keen pianist who played important ballads of the Romantic period on his piano and gave singing lessons to Marie Auerbach. His students remember that his room at Hamlin Hall always had a tripod and canvas ready for him to make a new piece of art, next to his dear piano. Traugott Fuchs has been described by friends and colleagues as both a lonely and a very social person. Concerning his more private moments and thoughts, resarch into his diaries, which were written between 1944 and 1991, as well as into his other writings, like his travel notes which he kept from all of the trips he took to different sites of Turkey, Italy, Greece, the US and Switzerland, will shed more light on the thus far hidden self-impressions and narratives of Fuchs. During the course of his life in İstanbul, Traugott Fuchs had a large circle of acquaintances and friends. Loved by his students and neighbors, he also developed close friendships with his Turkish colleagues, as well as with important Turkish artists and writers such as Sabahattin Eyüboğlu, Abidin Dino, Mina Urgan and Sait Faik. Fuchs seemed to have been embedded in many networks in İstanbul. 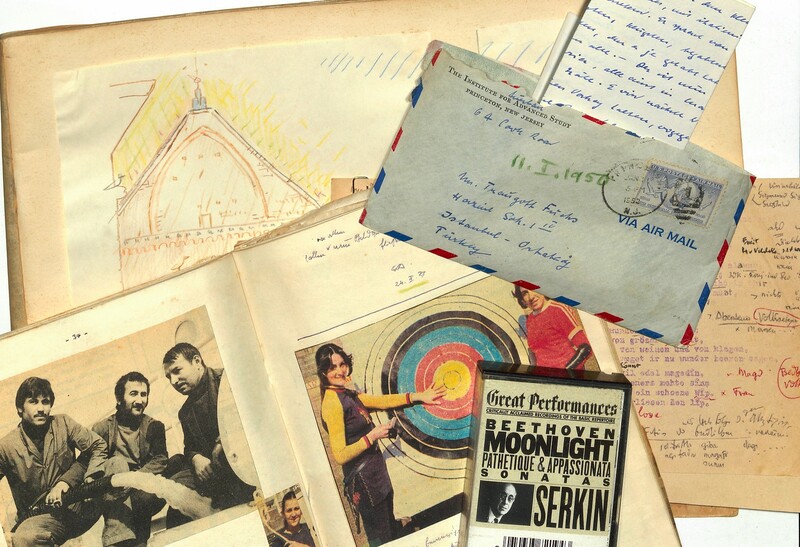 As demonstrated by his dozens of invitations to the German Consulate, concerts, Christmas parties and tea-gatherings inside and outside Robert College/Boğaziçi University, it is possible to say that Fuchs never lacked an invitation to a social event or gathering. Thousands of letters written by Traugott Fuchs and his friends, colleagues and family members testify to the immense number of connections that Fuchs had made. It has been estimated that around five thousand letters are present in the Fuchs archive today. Amongst this correspondence, the letters Traugott Fuchs exchanged with Leo Spitzer, Erich and Marie Auerbach, Hermann Hesse and Hellmut Ritter hold a special place. Traugott Fuchs is not one of the well-known, famous figures of the wave of intellectuals who fled from Nazi Germany to come to Turkey. Yet, his rich, still untapped archive reveals a multifaceted, unexamined intellectual who remained productive until the end of his life. This archive still awaits further, much deserved exploration.